MATr is a family of design from the moment it is conceived. The objects are designed to hold one another in position like packaging structures, preventing breakage during production and post-process handling. 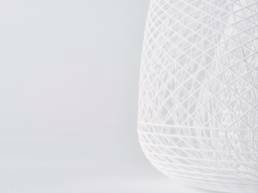 Once printed, the supports are extracted to give a basket, a bowl, a vase and a lampshade. MATr was selected by Lidewij Edelkoort, the world's pre-eminent trend forecaster for fashion and design, to be included as part of her curated collection for Rado's "Designing Lightness" exhibition in Basel, Switzerland. It is also included in the Alchemist collection by Industry+. © 2016 STUCK Design – Singapore’s Multiple Award-Winning Agency for Product Design, UI/UX, Mobile App Design, Industrial Design & Branding – All rights reserved.